Kathleen Wise and Benim Foster in “Talley’s Folly” by Lanford Wilson, at Merrimack Repertory Theatre through April 13. Photo by Meghan Moore. LOWELL — Actor Benim Foster as Matt Friedman addresses us just before “Talley’s Folly” begins, telling us how long the performance will be, and what he expects to happen. It is a device used by other, very successful plays — the narrator in “Our Town” comes to mind — and he even graciously and hilariously recaps his introduction at warp speed for a few latecomers minutes later. He notes that everything is in place for a romantic interlude, that the action we are about to see should have the rhythm of a waltz (“1-2-3”) and that the entire story should last 97 minutes (without an intermission). It all takes place on July 4, 1944 on the Talley family farm in Lebanon, Mo., in a dilapidated boathouse — the “folly” of the title — alongside the river that runs through the property. He is a stranger in a strange land, which he calls “The South.” Sally Talley (Kathleen Wise) — the woman he is determined to marry — firmly reminds him that he is in the Midwest, not the South. “Other than New York City and a few neighborhoods in Boston — everything to me is the South,“ says Friedman, a 42-year-old accountant from St. Louis who met Sally a year before the play takes place, courting her in the same boathouse, and making a vow to return and seek her hand. And return he has, although at first glance it appears his return was not actually desired by anyone, least of all Sally. She is a nurse’s aide in a nearby hospital, and she has seen the worst World War II has to offer in the injured and maimed young men who return home with scarring both physical and mental. It turns out Matt and Sally don’t know all that much about each other. Where did Friedman come from — he is obviously an immigrant — and why does the beautiful Sally, at the age of 31, seemed destined for a life of an old maid living with her parents? Wilson will drop subtle clues like bread crumbs along the trail — a new dress, a new tie — and eventually the attraction between the two principals will be palpable. Secrets will be revealed and it will all make sense in the end, but in this case, it’s all about the journey, a beautiful one conducted by two fine actors. Director Kyle Fabel is a frequent visitor to the MRT and he makes sure that his cast takes their time peeling the layers of the onion, never allowing the action to become mawkish. An outstanding set by designer Randall Parsons depicts the rundown boathouse in both its present reality and its faded glory, down to the honeysuckle flowers. 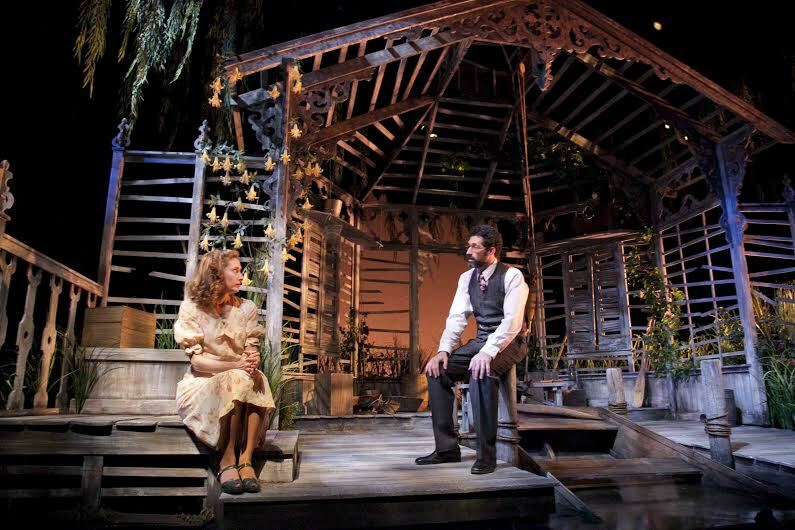 The lovely set is aided by the soft tones of a summer evening evoked by Paul Hackenmueller’s lighting and the effective sound design by Jason E. Weber, all the way down to the gentle movement of the river as its flows past the boathouse and a band playing softly in the background. “Talley’s Folly” is the kind of show that’s right in the MRT’s wheelhouse. You aren’t going to see big-budget musicals on the stage of the Nancy L. Donahue Theatre, but whatever you do see will almost always be quality theater, skillfully acted and produced. “Talley’s Folly” is no exception. The Merrimack Repertory Theatre production of Lanford Wilson’s “Talley’s Folly.” Directed by Kyle Fabel. Sets, Randall Parsons. Lights, Paul Hackenmuller. Costumes, Deb Newhall. Sound, Jason E. Weber. Through April 13 in the Nancy L. Donahue Theatre. http://www.mrt.org.